There are videos of readings of some of my stories here. Selected audio recordings are available on MacGuffin here. There's a Pseudopod podcast of 'Into the Penny Arcade' here. Marionettes and Into the Penny Arcade are published as chapbooks by Nightjar Press (2012). 'Bird Doll' in The Screaming Book of Horror ed. Johnny Mains (Screaming Dreams Press, 2012) . 'The Night Owl' in Issue 1 of Cutaway Magazine. 'Moth Light' in Issue 5 of Magpie Magazine. 'Grandma's House' in Patricide 03 Surrealism and the Uncanny. 'The Sand Ship' in Issue 7 of A cappella Zoo and reprinted in Issue 10, Bestiary: The Best of A cappella Zoo. 'The Woman Who Wore Frost Slippers' in Issue 1 of Unsettling Wonder. 'Casting Ammonites' in Shadows and Tall Trees 5. 'A Book Tale' is a contemporary fairy tale for adults inspired by the post-industrial Lancashire landscape. 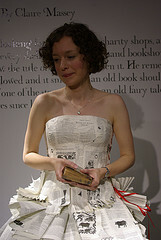 The story features a dress of moorland grass, another of smoke and feathers and one made from the pages of old books. I read the story in a specially commissioned dress made from seven copies of Angela Carter's Book of Fairy Tales as part of Litfest 2010. 'The Stone King' is a new fairy for all ages inspired by the landscape and history of Lancaster's Williamson Park. 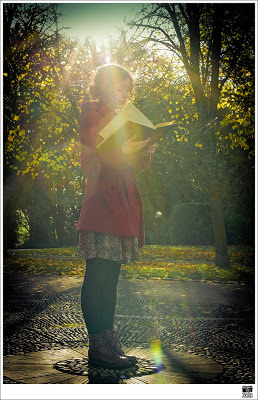 I read the story in locations around the park as part of Litfest 2012. The Stone King will be released as an audio storywalk later this spring. 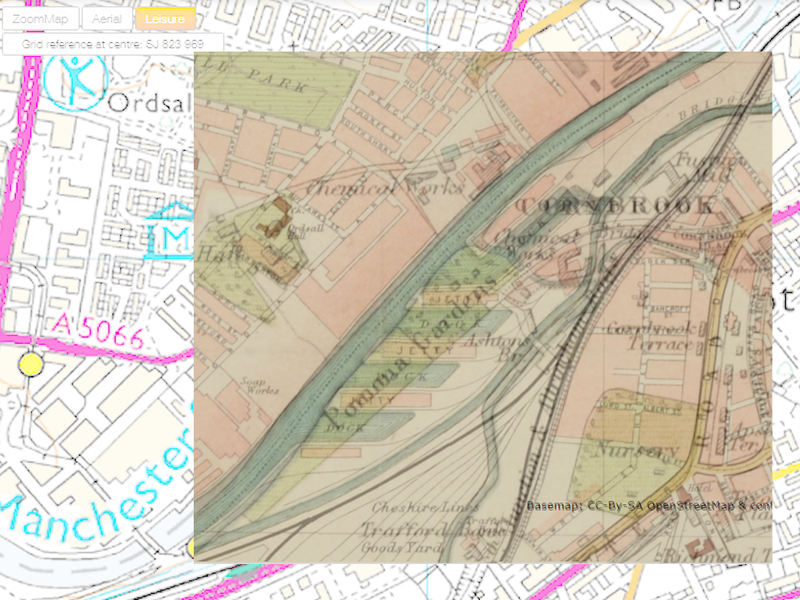 'Gold Threads' follows a woman as she recounts the lost streets and buildings of Preston that form a ghost map given to her by her father. The story was commissioned as part of Preston Guild 2012 along with stories by David Gaffney and Richard Evans. 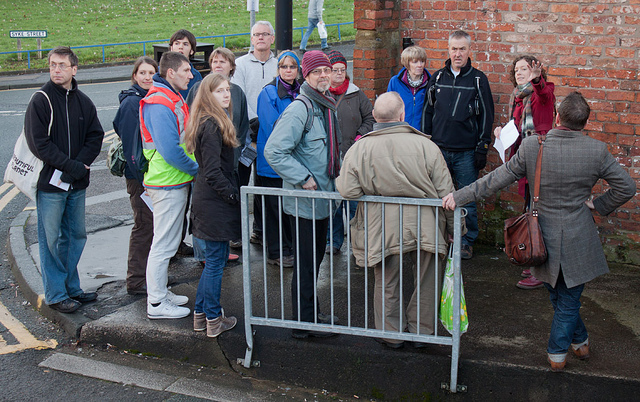 The stories were available as an audio trail during the Guild week and performed live in locations around Preston city centre. 'Pomona Fair' is a story about the tales we tell and those we don't, and a giant. It's inspired by Manchester's mysterious Pomona Island. The story was commissioned to be performed at the 2014 Blog North Awards. ‘Making a Breath’ is a story inspired by the legendary Manchester animation studio Cosgrove Hall. The site-specific commission was part of a six-writer project about ghost places and the re-appropriation of spaces. 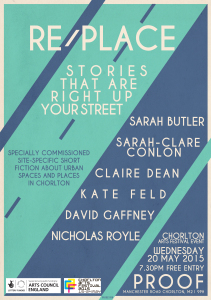 I read the story along with Sarah Butler, Sarah-Clare Conlon, Kate Feld, David Gaffney and Nicholas Royle as part of Chorlton Arts Festival 2015.